With this set of 1 speaker, you can easily connect your preferred smartphone, tablet or laptop to play perfect music wherever you are, whenever you want to. These surround Bluetooth speakers are perfect to enhance the mood at your party and play any kind of music you love with a 3” full-range stereo, digital sound amplifier and a 3.5mm AUX audio jack for external connection. 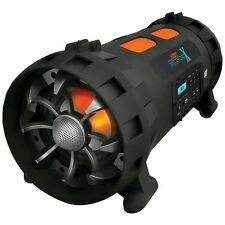 Works with iPhone, Android, Smartphone, iPad and computer with a wireless range of over 30’ ft. It’s just the right size for a very compact and portable speaker. It even has a convenient carry handle. MP3 Player Headphones. Comfortable Non-Interfering Headphones. Lithium Battery: 200mAh. Digital Audio File Support: MP3, WMA. USB Port Connection. Quick Connect: Combination Charging & Data Transfer Cable. PylePro PHPDJ1. Input Power: 100mWFrequency Range: 20~22,000HzLength of Cable: 7FT. Input Power: 100mW. Impedance: 32 Ohms ± 15%. Sensitivity (S.P.L): 115dB±3dB/mW(at 1KHz). Driver Size: 50mm. In-Wall Bluetooth Audio Receiver Dual USB Charger AUX-Input SPECIAL OFFER! 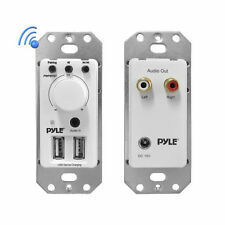 The Pyle PWPBT67 Audio Receiver Wall Plate adds convenient Bluetooth audio streaming and control where you need it. Mount the system in-wall for instant wireless music streaming with the ability to connect to your home theater. Quick and easy installation fits into standard size electrical/gang boxes and can be installed in virtually any wall at home or in the office. Wall plate features include rotary volume control knob with touch button controls, AUX (3.5mm) audio input for connecting external devices, RCA (L/R) outputs for amplified system connection and dual USB device charging ports. The audio receiver includes a power supply adapter along with integrated RJ-45/Network Ethernet jacks for optional system connection. Features: Made for the Streets: Rugged, Powerful & Portable! Digital Boombox Stereo Speaker System Bluetooth Wireless Audio Streaming NFC (Near Field Communication) Android Support Built-in LED Party Lights Pulse to the Music Control the Lights via the Free Downloadable ‘hPlay_Light’ App High-Powered Portability: Built-in Rechargeable Battery Full Range Stereo Sound Reproduction, Impressive Bass Output FM Radio with Digital LCD Display LCD Digital Display and Touch Button Controls Digital Sound Processing GX Amplifier Connect & Stream Audio from External Devices Aux (3. Add a splash of sound with the Splash SoundBox. Easily stream and play music from virtually any Bluetooth enabled device quickly and easily - that includes your smartphone, MP3 player, tablet, computer, etc. 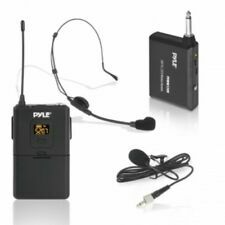 UHF Frequencies: The wireless lapel microphone system has UHF 610-675MHz frequencies selection for seamless, interference-free operation. An easy-to-read LCD information display provides constant monitoring of system operation, Receiver battery condition indicators with low-battery warnings. Features: 2-in-1 Speaker Radio Compact, Portable & High-Powered Wireless Hi-Fi Active Stereo System Bluetooth Music Streaming Ability Built-in Rechargeable Battery Digital Sound Amplifier FM Radio with Auto-Tuning USB Flash Drive Reader & Micro SD Memory Card Reader MP3 Digital Audio File Compatibility Aux (3.5mm) Input Jack Ability to Connect External Devices Side Panel Button Control Center Full Range Stereo Sound Reproduction Engineered Design Impressive Bass Response Convenient Carry Handle Bluetooth Connectivity: Instantly Stream Music from Your Devices Works with All Your Favorite Bluetooth Devices (iPhone, Android, Smartphone, iPad, Tablet, PC, etc.) Bluetooth Version: 4.
' ' ---Bluetooth V2.1 Technology ---Enjoy Hands-Free Calls with Built-in Microphone ---Connect and Stream Audio from MP3 Players, Smartphones, Tablets, PC, etc. ---Compatible with other Bluetooth-Enabled devices ---AUX Input allows you to connect your device directly with the included 3.5mm cable ---IPX7 Waterproof & Dustproof Construction ---Stereo Speaker Sound & Bass Output ---Control Volume & Song Selection Wirelessly ---Powered by 4 x AA Batteries (not included) ---Optional Power: DC 5V USB Cable Included ---Battery Life Provides Up to 15 Hour Playing Time ---10 Meter Max Bluetooth Streaming Range ---Touch Button Control Operation ---Glossy UV Surface Treatment ---Fold-Out Stand and Carry Handle ---Dimensions: 7.8'' L x 1.8'' W x 3.5'' H ---Sold as: Unit ---Weight: 1.14 lbs. You will also get a FM radio with auto-tuning with this surround Bluetooth speaker, as well as a SD-card reader and a USB reader, to play music in both MP3 and WMA digital audio file. 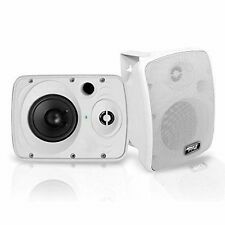 With an extra 3.5mm AUX audio jack, you can connect this speaker to an external set, or use its Bluetooth coverage of more than 30 feet around the house. Trending at $31.00eBay determines this price through a machine learned model of the product's sale prices within the last 90 days. Car Amplifier 2000 Watt 2 Channel High Power MOSFET Amplifier SPECIAL OFFER! 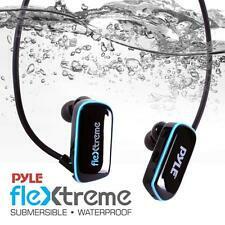 These Pyle Waterproof headphones feature an ultra-slim design, and fit securely into any ear. They work great with your iPod, iPhone, Zune, Sansa, or any other MP3 player or Cell Phone with a standard 3.5mm headphone jack. Use these with your waterproof media player for the ultimate maritime audio experience. Waterproof Earphones Are Ergonomically Designed For Comfort. Includes 3 Pairs Of Different Size Earbuds For Custom Fit. Caution! Do Not Use Underwater At Depths Of 10 Feet And Below. Frequency Response: 20~20,000Hz Impedance: 32 Ohms ± 15% Sensitivity(S.P.L): 110dB±4dB/mW(at 1KHz) Maximum Input Power: 20mW Speaker Driver Diameter: 10mm Plug Diameter: 3.
' ' ---Easily add Bluetooth wireless streaming to your speakers, stereo system or docking station ---Works with and enables Bluetooth for devices like iPads, iPods, iPhones, Androids, Blackberry, PCs, Video game consoles, Bluetooth Cell Phones & much more ---Extends the range from which you can play music via Bluetooth connection ---3.5mm/1/8'' Aux input allows the connection of additional devices ---Connects to Apple 30 Pin Docks ---3 Level LED illumination to confirm visual Bluetooth Interface(Red/Blue/Flashing Blue) ---Control your music wirelessly throughout your home ---Transmission distance: up to 10 meters (33 feet) ---Unit Dimensions: 2.15''H x 2.15''W x 0.45''D ---Sold as: Unit ---Weight: 0.14 lbs. Bluetooth Pillow Speaker with Built-in Speakers for Wireless Music Streaming SPECIAL OFFER! Features: Compact, Portable & Comfortable Bluetooth Music Streaming Ability Aux (3.5mm) Input Jack Connect & Stream Audio from External Devices Headphone Jack for Private Listening Built-in Rechargeable Battery Dual Built-in Speakers Full Range Stereo Sound Wired Remote Control Adjustable Volume Setting Perfect for Home, Office or Travel Bluetooth Connectivity: Wireless Music Streaming Receiver Works with All of Today’s Latest Devices (Smartphone, Tablet, Laptop, Computer, etc.) 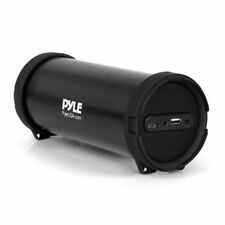 Includes Bluetooth Controller & Power Supply Bluetooth Network Name: ‘Pyle’ Bluetooth Version: 4.1 Wireless Range: 30’ ft. Technical Specs: Built-in Battery: Lithium 3. Bone Conduction Headphones with Bluetooth - Wireless Streaming Sport Headphones. Included in the box: bone conduction headphones, charging cable, manual, ear plugs. Condition is Used. The Pyle PPHP1037UB PA Loudspeaker is the ultimate high-powered cabinet system. Just plug it in and you're ready to play your favorite MP3 digital audio files. Works with all of your favorite bluetooth enabled devices Apple iPod, iPod Touch or iPhones. All critical accessories related to the operation of the item will be included. Features: Perfect for Audio, On-the-Go! Compact & Portable Hi-Res MP3 Player High-Resolution Lossless Audio Playback Integrated GX Audio Processing Amplifier Play Your Music via Micro SD Memory Card Slot Built-in Rechargeable Battery Color LCD Digital Display, 2’’ -inch Adjustable Volume Control Settings Playback Modes: Folder, Favorites, Random, All MP3 Digital Audio File Playback Support Headphone Jack, 3. Dual Loudspeaker Sound Package, 8'' Subwoofers, Bluetooth, 2 Speaker Stands SPECIAL OFFER! System Features: Dual 8-inch High-Powered Loudspeaker PA Systems Includes (1) Active Speaker (1) Passive Speaker (2) Stands Rugged, Durable & Reliable Sound Bluetooth Wireless Music Streaming Ability High-Frequency 1.0'' Tweeters Compression Driver with Titanium Diaphragm 2-Way Full Range Audio Projection Built-in Digital Audio Amplifier XLR Microphone Input 1/4’’ SpeakOn (8 Ohm) Input 1/4’’ SpeakOn (8 Ohm) Speaker Output Aux (3.
' ' ---Waterproof, Portable and Protective Case with Built-in Speaker ---Insert your Device and Play Videos and Music ---IP-47 Grade Waterproof & Dustproof Construction ---Enjoy Full Functionality of your Device While is Inside ---Engineered Clear Plastic is Responsive and Allows Touchscreen Use ---3.5mm Jack Compatible with Smartphones and MP3 Players ---Works with the Latest Smartphones like the Galaxy S, Sony Xperia S ---HTC One XL, Nokia Lumina 900, all iPhones, and more! ---Requires 3 x AAA Batteries (not included) ---Glossy UV Surface Treatment Finish ---Amplifies Your Device with Stereo Speaker Sound ---Dimensions: 3.85'' (W) x 7.95'' (H) x 1.37" (D) ---Fits Devices up to: 2.77'' (W) x 5.37'' (H) x 0.46'' (D) ---Sold as: Unit ---Weight: 0.8 lbs. Uses Bluetooth 2.1 to connect to smartphones and tablets. Bluetooth range: 30’. Full-range stereo sound with digital sound amplifier. FM radio with auto-tuning. Condition: new. Housing: engineered ABS. Wireless Bluetooth Earbuds - Waterproof Sports In-Ear Headphones with Microphone for Call Answering. Wireless Bluetooth Music Streaming Earbuds. 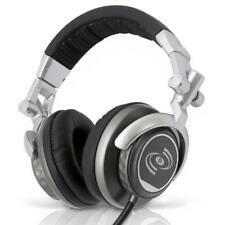 Sleek & Sporty Headphone Design. Built-in Microphone for Call Answering. With this Bluetooth surround speaker, you can connect any of your preferred electronic devices via Bluetooth – an Android device or an Apple product, laptop or PC. 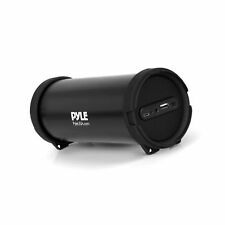 This portable boom box Bluetooth speaker is a high-powered tube boom box with an active stereo speaker system, digital sound amplifier and a full range stereo for perfect sound.Wireless Range: Over 30 Feet.
' 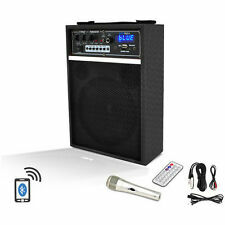 Features: ---Compact, Portable & Powerful PA Speaker System ---Karaoke Microphone Talk-Over Mode ---Bluetooth Wireless Audio Streaming ---Built-in Rechargeable Battery ---FM Stereo Radio ---USB Flash & Micro SD Memory Card Readers ---MP3 Digital Audio File Compatibility ---(2) 1/4’’ Audio Connection Inputs ---Aux (3. Tested to verify they are working. 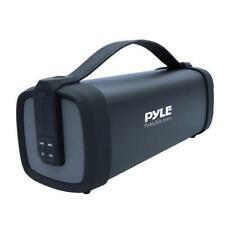 Pyle PWMA325BT. This versatile system was designed with quick setup in mind – to add high-powered sound and visual style to the next occasion. The built-in flashing DJ party lights illuminate the area to add a cool effect while your wireless music plays. Pyle PWMAB250. 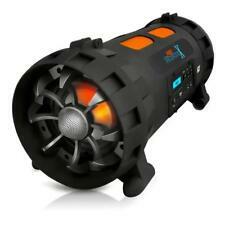 Bluetooth Portable Speaker System. This item is NEW in an OPEN BOX. Microphone is NOT INCLUDED. Microphone NOT INCLUDED. TV & Audio Parts & Remotes. Video Gaming. Computer Hardware & Accessory. The Pyle PHPW2 Wireless Headphones provide Clear, Bright, and Full sound without the hassle and tangle of wires to get in your way. With over 100 Feet of range, feel free to roam with these Pyle wireless headphones. Lot of (4) New! 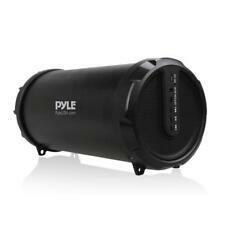 Pyle PDICBTL35 Bluetooth 2-Way 3.5" Ceiling/Wall Speakers. You will be able to stream audio from all of your favorite Bluetooth devices (like smartphones, tablets and computers). Round style speaker design makes them perfect for any custom audio application on virtually any flat surface, without cluttering floor space. New open box item. Tested! PHPW2 FM HI-Fi Wireless Headphones with Super Bass. FM Radio and Wired Reception from PC CD DVD Players. Wireless Reception from TV. Wired Reception to MP3 Player. AM/FM Radio with Rotary Dial Manual Tuner. Count of Subwoofer One. Perfect for the Shower or Bathroom! Radio Frequency: AM: 540-1600 KHz FM: 88-108MHz. Built-in High-Powered Speaker. Hang it Up: Hanging Strap Design.